In our Buffalo Bill Museum, visitors encounter William F. “Buffalo Bill” Cody the man, as well as the showman and international celebrity. Learn about his life and times in our new exhibition, a blend of original objects, multimedia, and innovative interactive elements. A view of the new Buffalo Bill Museum, with the TE Ranch exhibit in the foreground. If you know the American West, it’s a good bet you already know Buffalo Bill, also. In our Buffalo Bill Museum you have the opportunity to meet him again, for the very first time. In the Pantheon of iconic figures of the American West, William F. “Buffalo Bill” Cody stands front and center. Even today, he is still immediately familiar, just as he was then, by his trademark mustache and goatee, his flowing white hair, his Stetson hat, his buckskin jacket, and his leather boots. In his lifetime, he introduced countless millions of people worldwide to the American West. And, because of him, untold numbers came to the West to experience it for themselves, or, at the very least, dreamed and imagined themselves doing so. 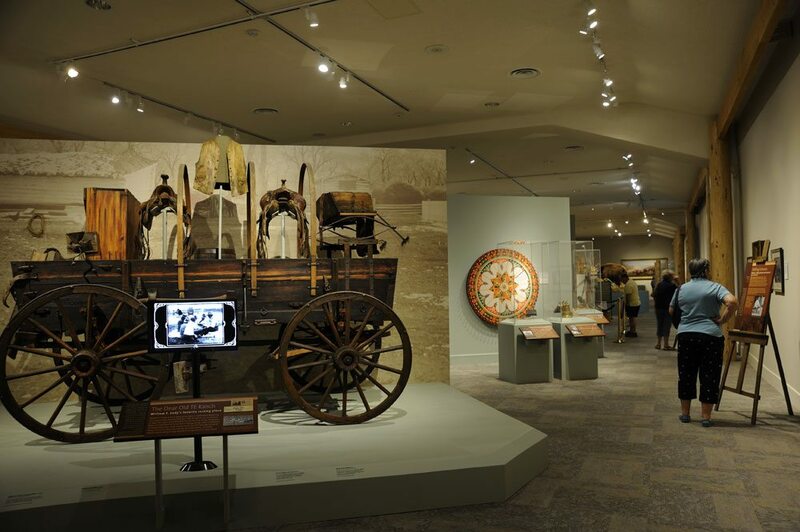 In 2012, the Buffalo Bill Museum—the flagship of the Buffalo Bill Center of the West—remade itself in its first major renovation in almost three decades. 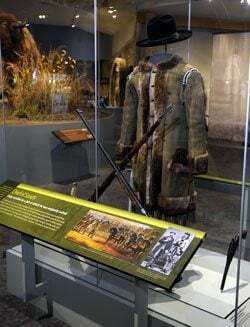 Offering authentic artifacts, state-of-the-art exhibits, engaging interactives, and a compelling story, the “new” Buffalo Bill Museum is a museum for the twenty-first century about one of the most important historical figures of the nineteenth century—someone whose legacy still continues to shape and define how we think about the West, America, and ourselves. In reintroducing a leading American icon, the Buffalo Bill Museum invites visitors to explore the myriad facets of a unique individual—William F. Cody (1846 – 1917). It was through the persona of “Buffalo Bill,” and the agency of the traveling outdoor show, Buffalo Bill’s Wild West, that Cody brought the West to the world and the world to the West. Yet the full measure of the figure behind that persona deserves to be better-known and appreciated. Apart from being a showman, actor, hunter, and western hero, Cody had many identities: teamster, Pony Express rider, Civil War veteran, Congressional medal-of-honor recipient, outdoorsman, and onetime hotelkeeper. He was a town-builder, a philanthropist, an entrepreneur, and a visionary. He was also a son, a sibling, a husband, and a parent. A “man of many parts,” the real-life person who was William F. Cody turns out, when you get right down to it, to have been pretty much like the rest of us: ambitious, lonely, conflicted, searching for meaning, struggling to make ends meet, constantly facing adversity—in short, someone genuinely human and authentic. The Buffalo Bill Museum brings this flesh-and-blood individual to life as never before. To be sure, Cody’s experiences were not unique—though perhaps few other individuals of his time matched him in the range and diversity of his experiences. The names of figures such as Daniel Boone, Davy Crockett, and Kit Carson became legendary in their time, and Cody himself eventually might have joined the ranks of that pantheon simply for his deeds and exploits. But it was his special prowess in one regard—hunting buffalo—that earned him a deathless nickname and vaulted him from relative obscurity to lasting fame. It was through this persona that William F. Cody, the man of the West, would become “Buffalo Bill,” the man of the world. Cody’s role as guide for hunting trips featuring famous dignitaries, and his genuine heroism and deeds in service as chief of scouts for the U.S. Army during the 1860s and 1870s, strengthened his reputation as a man of the West. Increasingly, however, Cody’s given name, and the fame that accrued thereto, were being subsumed under the persona of his acquired nickname. From 1869, when a hack writer named “Ned Buntline” made Buffalo Bill the hero of breathless dime novels, and into the 1870s, when that hero became a stage actor and star of frontier melodramas based on his exploits, both real and imagined, Buffalo Bill’s career was on the ascendancy. Buffalo Bill’s rise became even more meteoric when, in 1883, Cody and several associates introduced “Buffalo Bill’s Wild West,” an innovative traveling outdoor spectacle featuring cowboys and Indians, sharpshooters, wild animals, and dramatic re-creations of scenes of frontier life. As both star and impresario, Buffalo Bill became a living, breathing icon and embodiment of America’s western experience—a larger-than-life figure whose exploits and stories about settling the West captivated millions, not only in North America but also through Europe and, from there, to the rest of the world. Buffalo Bill performed before royalty, was feted by heads of state, became an object of adulation, posed for countless portraits and gave innumerable interviews, and even sat for an audience with the pope in the Vatican. The man of the West had become a man of the world. While increasing fame made Buffalo Bill an international celebrity, life became challenging for William F. Cody. His marriage turned rocky. Touring for long stretches at a time, he missed out on much of his children’s early lives, and barely made it home in time to see his 5-year-old son die in his arms. Making money hand over fist, he lost much of it in ill-chosen investments and dubious schemes. He struggled with alcoholism and was plagued with bouts of depression. With countless admirers but few, if any, close friends, Cody was at the same time one of the world’s best-known personalities, but also one of its loneliest people. Although Buffalo Bill was now very much a man of the world, William F. Cody never forgot his western roots. Indeed, the more his fame spread, the more the West beckoned to Cody as a wellspring of opportunity and a place of refuge and solace. From his home base in Nebraska, Cody looked ever westward, to the Rockies and the desert Southwest, seeking to become, once again, a man of the West—but of the New West, a land of promise, rather than the Old West of the frontier, now all but vanished. Ironically, the persona of Buffalo Bill that he had created now became the figure he sought to shed in order to reconnect with himself, and the West, once again. As William F. Cody neared the end of his life, the things that he loved doing most were the same things he had enjoyed during his formative years: camping, horseback-riding, hunting, guiding, tending cattle, spending time outdoors. In northwest Wyoming, near Yellowstone National Park, he helped found a town that stills bears his name, and, in so doing, helped achieve his vision of creating a gateway for visitors worldwide to come and experience the still-wild West. Today, the man of the West continues to bring the world to the West, even as he did in his own time.